Same day (today). 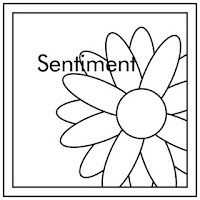 Same stamp set (In Bloom by PTI). 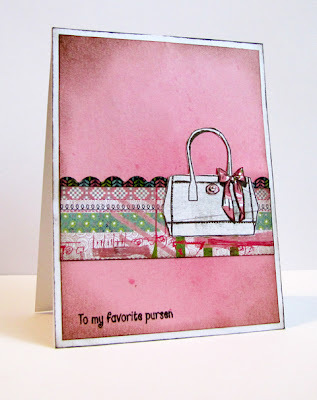 Same challenge (Clean and Simple Stamping). Yes! It's a Carbon Copied Day with Piali from Touch of Creation. Did you know that her work is amazing?! Piali chose to work with the Clean and Simple Stamping Sketch and as a bonus, this week they are partnering with the ColorQ Challenge so I was able to choose the palette we got to work with, #89. Some nice, deep, beautiful rich tones. Feeling fallish, I guess. Every time I pull out this set, I can't help but hum the Toy Story opening song in my head due to the single sentiment. Makes me happy. 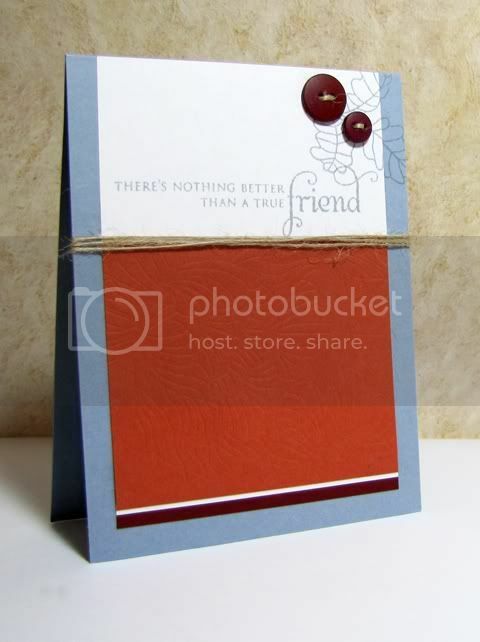 I used the In Bloom Impression plate on my orange panel and then chose to feature the sentiment with stamping. 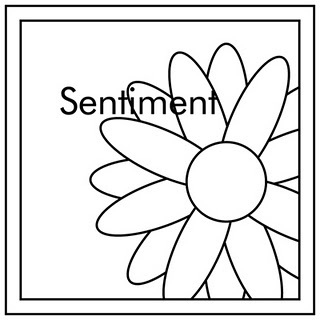 I highlighted the series of three leaves with a few buttons in the top left corner. 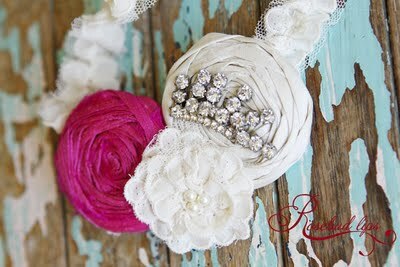 Please stop by Piali's blog to see her take on these two challenges! Teri Anderson has designed one last sketch for Skipping Stones Design Sketch Challenge this month, and it is a fantastic one! This also marks my last challenge as a guest designer, thank you so much gals for having me! 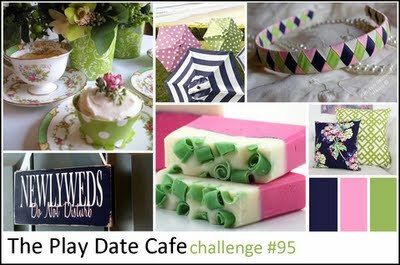 Find out more about the challenge details, see more amazing samples and find out what you can win over on the Skipping Stones Design blog. Did a little playing with text paper and distress inks for my card today, as well as some doodling. 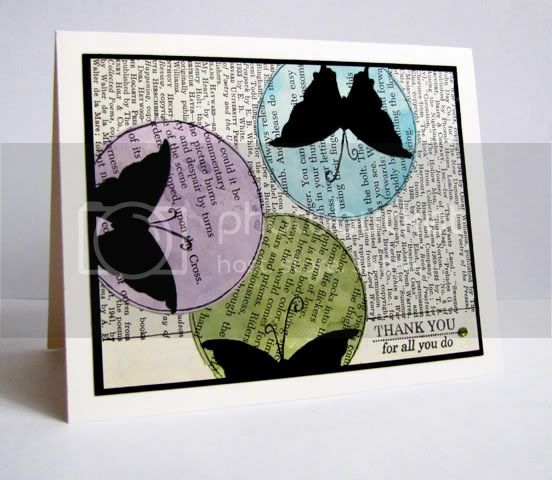 The main butterfly silhouette image from Garden Stamp Kiss was stamped and then I drew the whimsical antennae. Here's to hoping that happiness will come to sit softly on your shoulder today. Ink: (Dusty Concord, Peeled Paint, Broken China Distress) Ranger, (Onyx Black) Versamark. Him (looking over my shoulder after coming in from playing): Hey, that looks like a piece of notebook paper. Me (looking at him, pleased that he recognized my project): It is supposed to. Him (a thoughtful look on his face): Except, there are two lines going down instead of one. And there are five holes instead of three. Me (still smiling that he is interested in my project): It's called vintage, this is the kind that I used to have in school. Him (with a big grin from recognition now): Oh, you must be old then. Me (slightly disgusted and heartbroken): Gee, thanks, son. 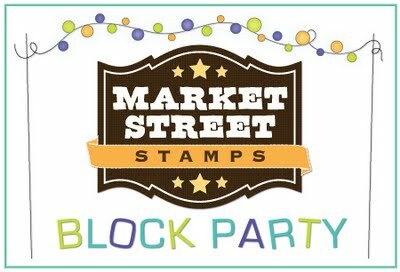 Market Street Stamps is having a block party and I joined in on the fun with a clean and simple creation. 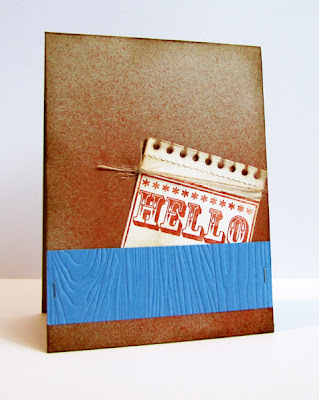 I stamped Vintage Notepad onto a natural cardstock panel, rounded the corners and punched the sides and distressed the edges to resemble a torn page. So easy to do! 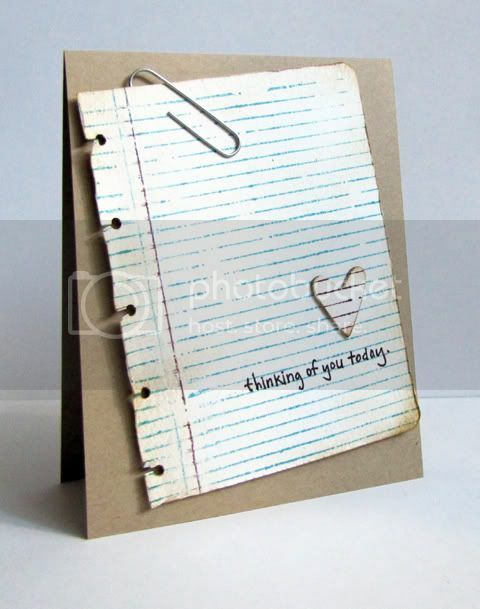 The chipboard heart was stamped as well with the background stamp, this time in the corresponding red from the notebook paper, and I finished the panel with a handwritten sentiment. (I went round and round with a sentiment and finally decided on this one but now I think I need to make fifteen more cards with the others that I had in mind!) It was adhered to a kraft base with foam adhesive and I added the paperclip, well, just because I thought it looked cool. She is such a tiny little peanut, arriving almost a month early. They weren't ready for her, but managed to scramble and find things at the last minute...including my babies' crib. It was kind of sad to see it being carted away, like a chapter closing in my life. But, I knew the new family desperately needed it and would put it to good use, rather than it collecting dust in a storage. 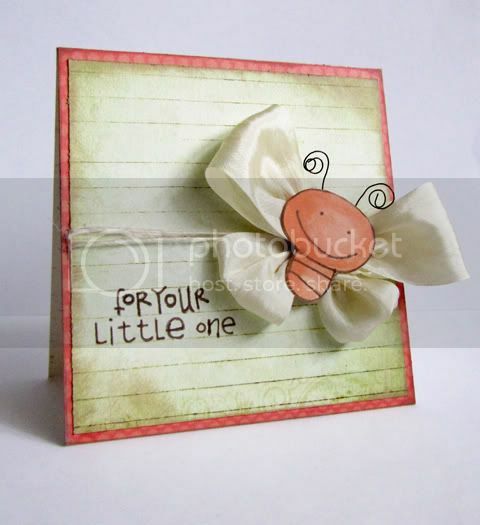 A new baby calls for a card, right? And I'm happy to say that this card will actually be given away, rather than collecting dust in storage, hah! 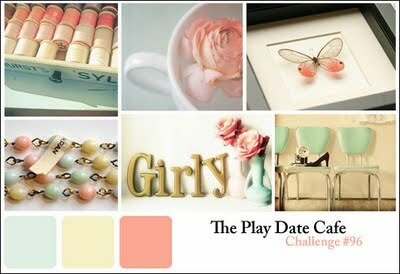 The sketch is based off of Moxie Fab World's Square Sketch Challenge and the lovely and soft color palette comes from The Play Date Cafe. 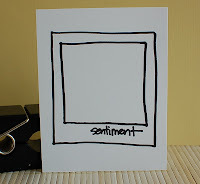 I started with a patterned paper panel that was misted with a light green, inked the edges and then stamped the sentiment (a mix of three different stamp sets! 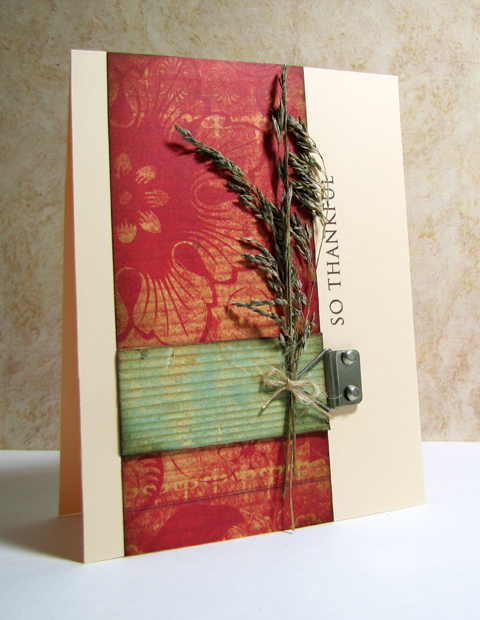 ), wrapped it with twine and adhered it to another patterned paper panel and the card base. 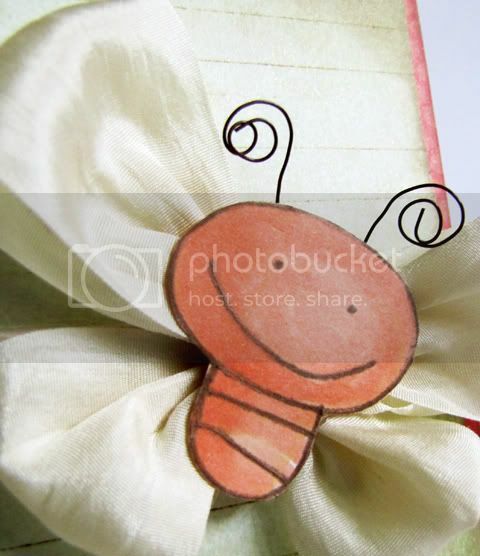 The cute little bug was stamped and colored with markers. I snipped off the wings and antennae and created some large whimsical ones with silk ribbon and craft wire. The open mouth, the wide eyes, the excited expression on his face...it is all priceless when you tell him he can do what he's always wanted to do this past year. He can do it because it is his birthday. You tell him "Yes, honey, yes you can. Today it is all about you." 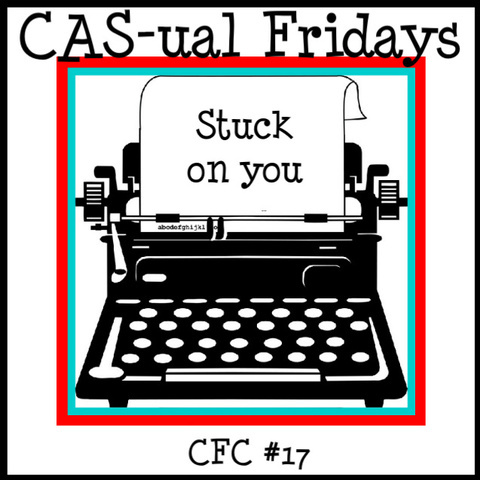 Today it is all about the new CAS-ual Friday Challenge: Stuck on You! Simply showcase stickers in a unique and exciting way on your clean and simple creations. 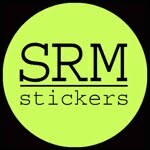 There is an awesome, I mean really awesome, sponsor this week: SRM Stickers. Their sticker products are exceptional, top notch and uber cool. 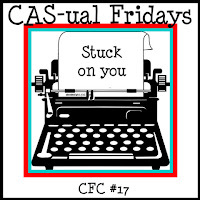 To find out more about the challenge, the prize, the rules and to see great inspiration from the Girl Fridays, visit the CAS-ual Fridays Challenge blog. 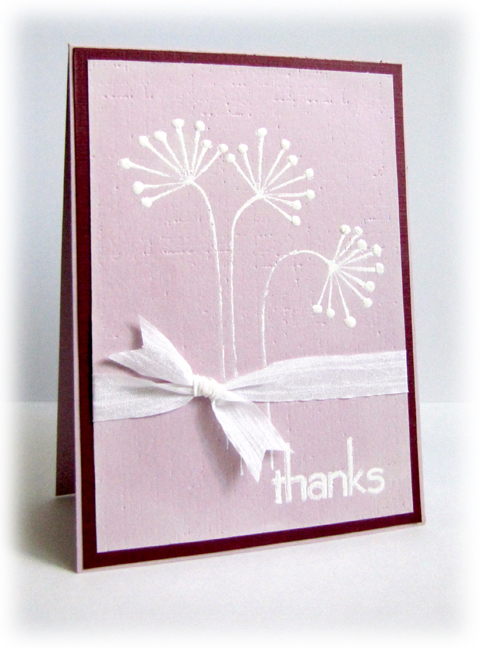 My clean and simple creation started with a white card base cut to size, and partially embossed. I then banner die cut some pattered paper and stuck the clear stickers over it. The piece was finished with two simple lines of somewhat straight stitching. 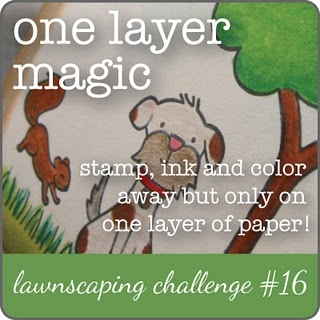 Can't wait to see what you will create with stickers for this challenge! A pair in a chair. Kind of like Sam I am and Green Eggs and Ham. Or one fish two fish red fish blue fish. I am partial to Thing One and Thing Two, since I'm an identical twin. I am absolutely delighted to have a Carbon Copied visit with the super talented Jennifer Rzasa. 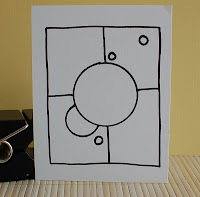 We are both featuring our version of the Card Positioning Systems sketch using the stamp set by Furnishing Fun from Schlosser Designs. Jennifer's work blows me away every time I visit her blog. I love her use of bold designs and color. Her composition and execution is spot on in each and every project she posts. Congratulations to her as well for making the top 5 in the 2011 Gallery Idol Contest! 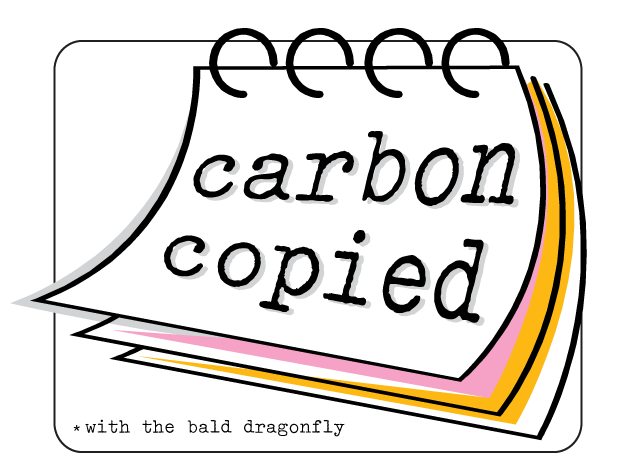 Stop on over to her blog, Our Change of Art, if you haven't already, to check out her Carbon Copied project. You will be amazed, for sure. 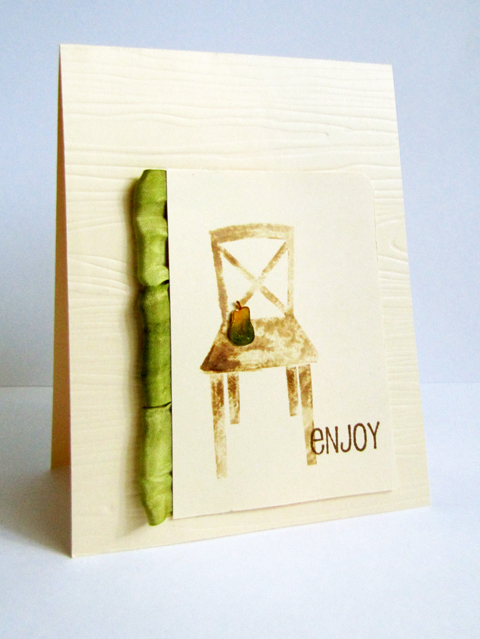 The card's background has been impressed with woodgrain and then a panel-with one rounded corner, also featuring the pear in a chair, was adhered on top of that. Hand dyed silk ribbon was tucked under the panel to finish the sketch. Darn photographing at night, the card has a lot more depth in real life but I ran out of time to photograph during the day! 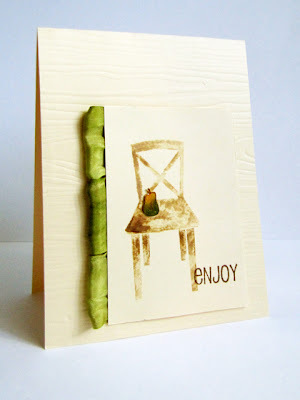 A little treat set created by me (quick, easy and totally inexpensive) is being featured over at the May Arts Blog today. You could be a winner of some tricks or treats by leaving a comment on any May Arts/Our Craft Lounge post all this week! Wings a-flappin', beak a-chatterin', cold head bobbin' back 'n' forth. He says, "It's not that I like ice or freezin' winds and snowy ground. It's just sometimes it's kind of nice to be the only bird in town." 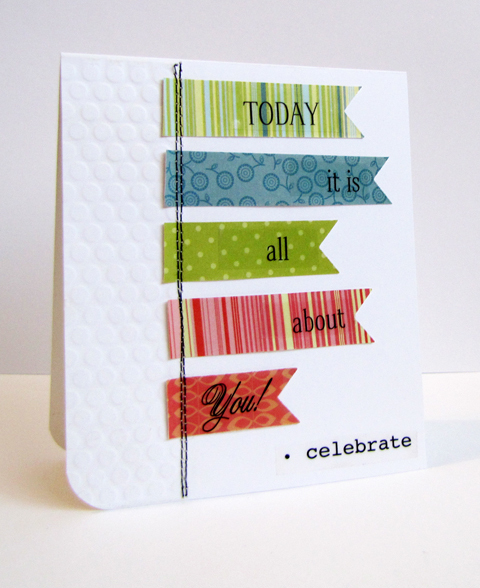 Today marks a fabulous new sketch challenge at Skipping Stones Design. My take was very literal, as you can see! 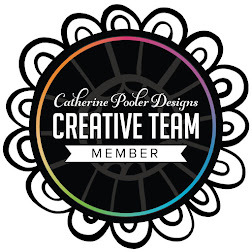 Please take a minute to check out the challenge and see all the other amazing creations from the design team and guest designers. I also used the brilliant color combination from Play Date Cafe Challenge. Please check out my Blog For Boobies Post here! Welcome to the last day of Blogs for Boobies! Remember, 100% of what you bid will go to the Susan G. Komen Foundation! If you are the top bidder you will receive a paypay invoice for the amount that you bid. #2: There is still time to shop! Through midnight on the 23rd of August, Skipping Stones Design will donate $2 for each stamp set sold to the Komen Foundation. Seriously, these sets are awesome, there is a style for everyone! Together we can make a difference! Thank you from the bottom of my heart for all those that bid, are thinking of bidding, and will outbid the last bidder! 1. Everyone else is still sleeping, including the dog, and the house is unbelievably quiet. I talk to myself in my head and things seem to come together. 2. I have a female companion where I can bounce ideas off of, enjoy bridge mix and have adult conversations. 3. My two boys are extremely interested in making a card and I can see their thought process, actually, hear their thought processes as they talk aloud as to what they like and do not like. 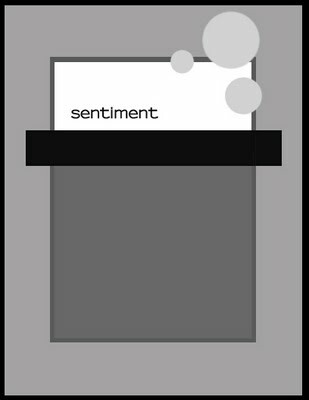 The above card was created when #1 was in effect. 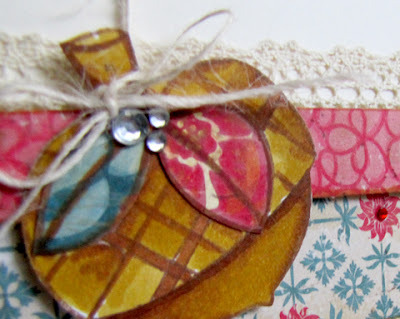 I used the sketch from Page Maps and the inspiration photo from Paper Smooches Sparks Challenge. Don't blink. Yes, this is my attempt at shabby chic/vintage. I enjoyed adding details such as crochet lace and red rhinestones and coloring with my markers. The below two cards where created by my boys when #3 was in effect. It was a fun time. 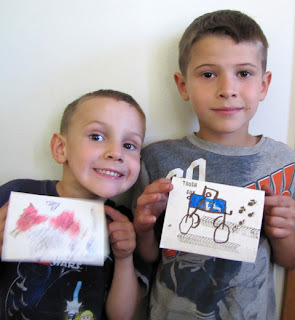 They made cards for their Grandma and Bumpa. Perfect for the Simon Says Summer Holiday Children's Challenge. Each of them insisted on taking their own photograph for their cards, please excuse the quality. Cole (age seven) chose to make a card featuring a monster truck after seeing some "tire track" stamps. Chase (age four) asked Grandma what her favorite color was and proceeded to color in the bats with pink. The Monster Truck card features You're the Man from Practicing Creativity Designs and Grunge from Skipping Stones Design. "Score one for me!" "Oh, did you see that?" "That one is mine, I called it first!" Driving down the scenic roads in Wisconsin it is not uncommon to see wildlife, so to make the long rides fun, our family keeps track of what we do see. Turtles. Deer. Quail. Turkeys. Foxes. Gophers. Pheasant. Raccoons. Porcupines. Sandhill Cranes, etc. 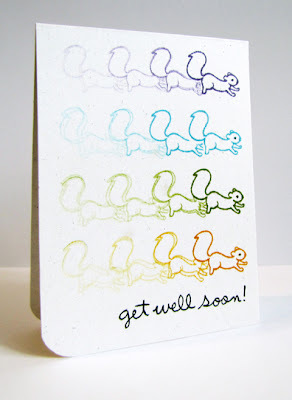 And yes, even squirrels count. I attempted (cough, cough) a one-layer magic card for the current Lawnscaping Challenge by stamping and stamping off in a rainbow of colors that darn cute squirrel from Lawn Fawn's Critters in the Burbs to replicate the swift movement that squirrels have. Hee hee. I can just picture the eyes of both my boys getting huge, their necks turning to look if I was the one to shout "I just saw a purple squirrel, or was it yellow?" It's all about embossing for the 16th installment of the CAS-ual Fridays Challenge! 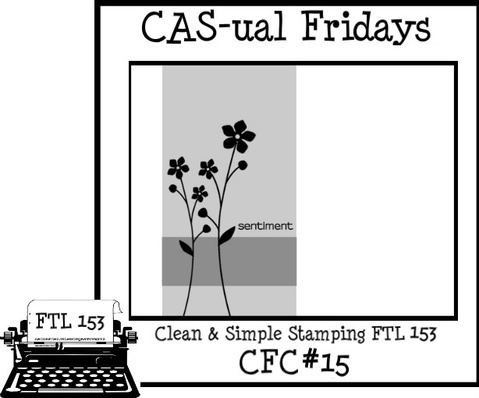 To check out more details on the challenge, get rules, read about the fabulous sponsor and prize from The Stamps of Life by Stephanie Barnard, and see all the great inspiration from the Girl Fridays, stop by the CAS-ual Fridays blog. I featured both dry embossing and heat embossing in my card today. (Which, by the way, was heavily inspired by a fabulous card from Susie Wittwer, on page 151 in the current Papercraft's StampIt! Magazine.) I purposefully shook off a lot of the powder before heat embossing for a more distressed look and then highlighted a few areas of the dandelions with a white gel pen and white enamel. Hope to see you play along! Welcome to the second annual Blog 4 Boobies Fundraiser! all proceeds will benefit the Susan G. Komen Foundation! Skipping Stones Design has a listing of the participants for Day One and Day Two, you don't want to miss out on their fabulous projects that are up for auction too! 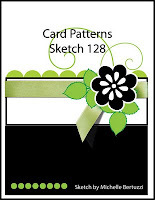 The above card (with envelope) that is up for auction, was inspired by the current CardPatterns Sketch #128. 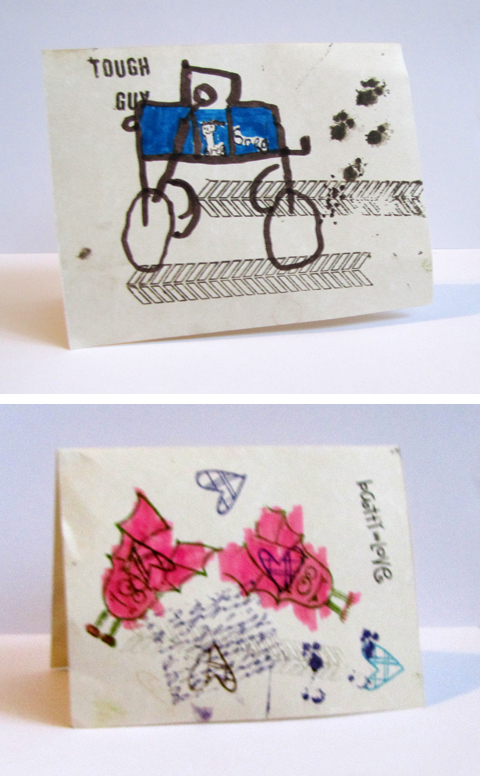 I've also got a set of 4 cards, with silver envelopes that will be shipped to the highest bidder right along with it! Finally, (and I'm super excited about this) to sweeten the pot and encourage my blogging friends to participate in bidding for this amazing cause, I'm offering up the following that will also be included in my featured card and card set to the highest bidder! Find the comment section of this post and let me know dollar and cents amount of what you are willing to pay for the above featured items. Next to your bid, please type in your e-mail address. Typing your e-mail address is the electronic equivalent of signing your bid. Also it will help me contact you if you are the highest bidder! Once you have entered your bid/comment, sit back and wait. If someone outbids you then you may bid again! Bidding will continue until 8:00 p.m. (MDT) on August 23. **Please note that I will repost my Blogs 4 Boobies items on August 23 as a reminder that the auction will be ending that evening. When I re-post, bidding will continue on the NEWEST post and that comment section. The winner of the auction will be the highest bid (that includes an e-mail address) in the comment section of the MOST RECENT post. Skipping Stones Design will send you an invoice for your donation/bid amount upon completion of the Silent Auction. 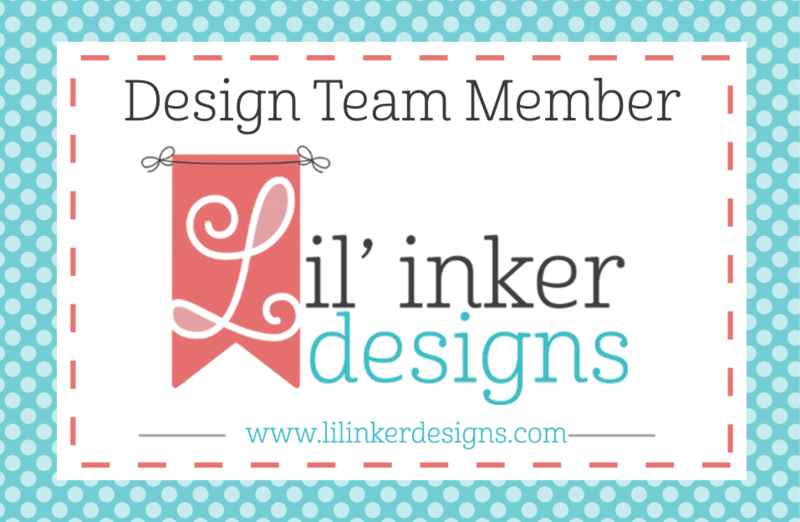 Please pay that invoice as soon as possible, so I can get your card/project in the mail to you. Remember, 100% of your bid will be donated to the Susan G. Komen foundation! 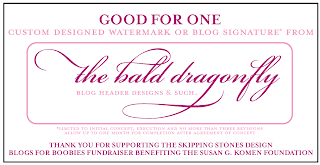 Last year, with your help, Skipping Stones Design raised $1108.99 for the Susan G. Komen Foundation. It is our goal this year to raise $1500! Please note that in addition to the auction, $2 from every Skipping Stones Design stamp set purchased through August 23rd will go towards the total! Now is your time to stock up on these fabulous stamps! 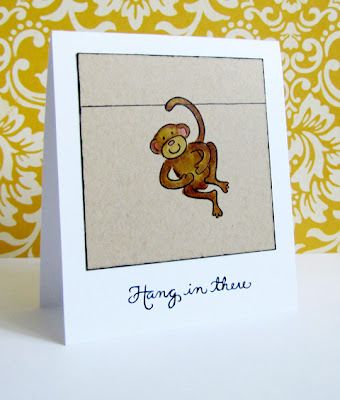 Click Here to laugh at some of SSD's funniest stamps, click here to be inspired or click here to see everything they've got! 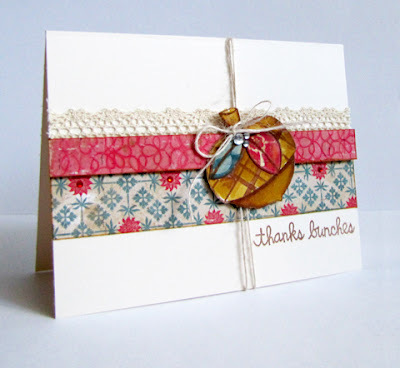 Welcome to the blog hop featuring Sketch Challenge 89 and the release of Everyday Blessings from Skipping Stones Design! 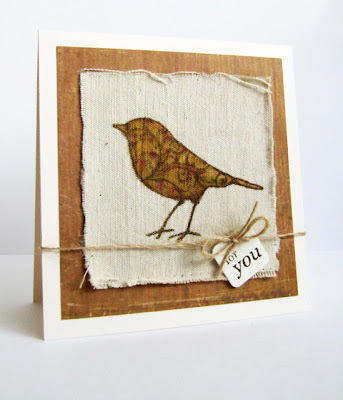 Amy's blog was the stop before mine-her designs always knock my socks off! This set is beautiful, my friends! I chose to work with the large outlined bird for my card by first stamping him onto some canvas and then coloring in with Copics. (Can someone please remind me who showcased this technique so I can give proper credit where credit it due?! I love the technique!) 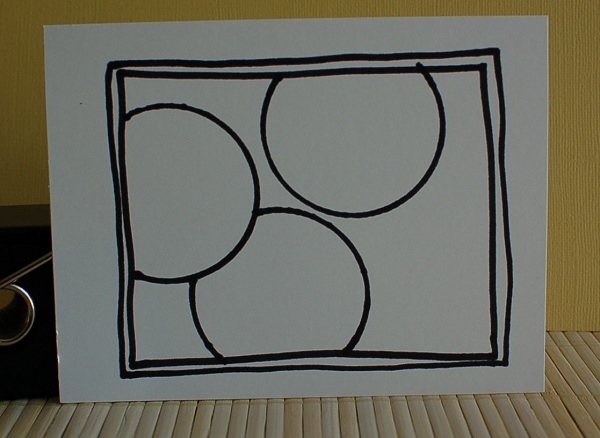 The canvas was then adhered to subtle patterned paper and then to the card base. A bit of twine and a sentiment stamped tag completed the ensemble. If you participate in the sketch challenge, you could win a free stamp set of your choice!!! Head on over to Kandi's blog for some more Skipping Stones Design inspiration! Here's a list of all the stops today! 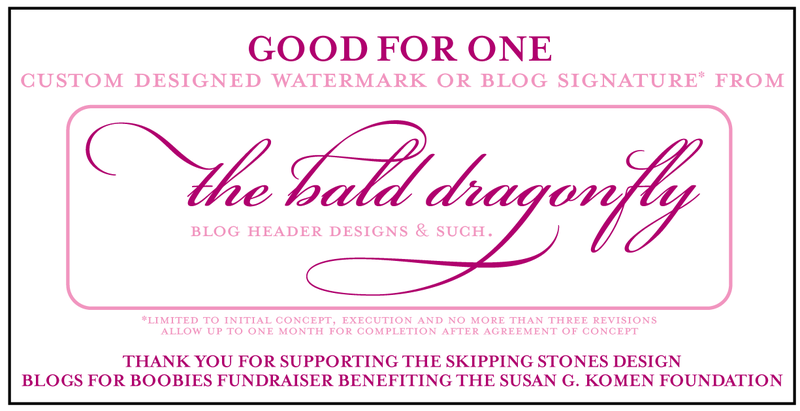 Skipping Stones Design is also in the midst of their Blogs for Boobies Blog Bounce Fundraiser! Click here to learn more about this fabulous cause. Seriously, it is truly phenomenal! Hello! A rusty hello! Today Jen W., from JENerally Speaking, and I are playing along with the Inkspirations Colour Challenge #82. We are both using the Purple Onion Design set Hello Noteblock. 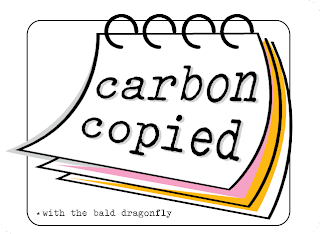 That could only mean that today is also a Carbon Copied post! (Thank you to everyone that has signed up already, this is going to be tons of fun!) 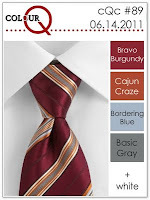 Please stop by Jen's blog today and see her great take on the challenge! I started following the talented and super sweet Jen and the creations she makes in her Craft Cave after "meeting" her through a common blogging friend, Lynn. It is amazing how friendships can develop in this blogging community, and I am so grateful for them. 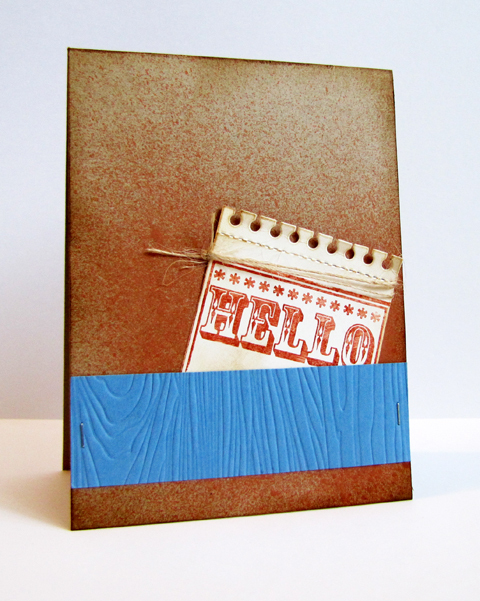 For my card, I sprayed some mist onto kraft cardstock, stamped a portion of the large block image onto a diecut vanilla sheet of paper and tucked it behind an embossed blue panel. 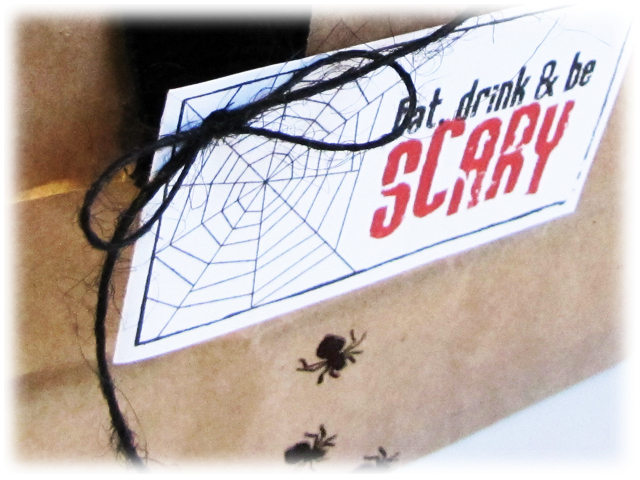 I felt that the twine, woodgrain and messy rust spray worked well with the masculine, old west style letters. Oh, and I added some tiny staples too, for that extra masculine touch! 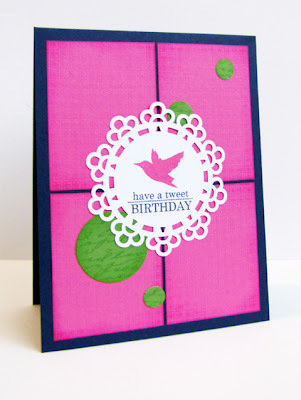 Welcome to the DeNami Design August Blog Hop! The stop before me was the blog of the talented Amy. My sister works hard. She's good at her job. People respect her and she respects them. I made these little ditties for her to give to the employees at work, just to let them know she cares! 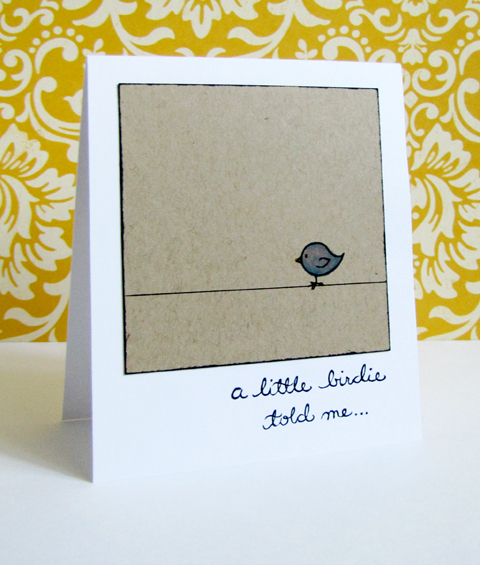 Mini cards are perfect for card sets, and for the informal "I'm thinking of you" kind of reason to send a card. The set contains four cards total-the two not pictured feature a slightly lighter colored monkey and then a little red bird! A special thanks to Lisa for thinking of me and making these cards possible. 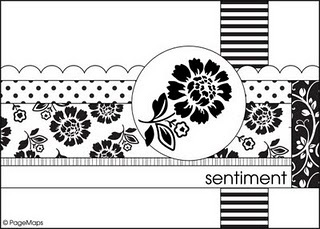 I am so excited to finally have in my reach some lovely DeNami sentiments to go along with the images. For my Polaroid inspired cards, I stamped each image, the monkey and the little bird, onto kraft paper and colored with Copics. 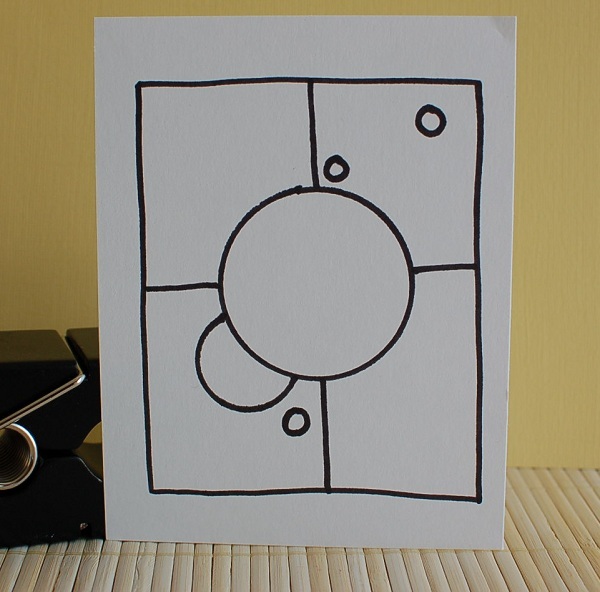 Then I drew a black line, either to hang from or perch upon, with a marker, inked the edges in black and adhered them to a stamped card base. I love the fact that I don't really often have to use a stamp positioner with DeNami stamps, as the rubber directly lines up with the image imprinted onto the wood block. Thank you so much for visiting me and my mini cards today! Your next stop is one of the masterminds behind DeNami, super sweet Paulina Nakamura! If for any reason you get lost along the way, the DeNami blog has all the details. You have until August 15th at 11:59 PST to leave comments on all the blogs to be eligible for a prize-three $20 gift certificates to the Denami Store! There is some serious inspiration along the way! 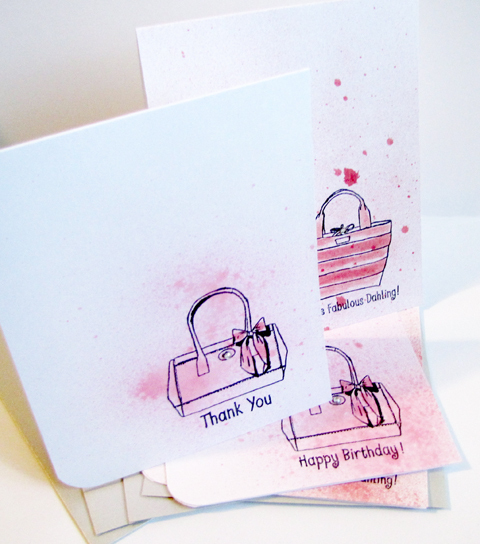 It was later at night and pitch black outside when I decided that my card needed a "little something extra". Sneaking outside, I walked in the dark across our lot in search of some dried grass. All of a sudden a spotlight shone on me and I immediately began to panic. I was ready to explain to the policeman that it was ok-that this was my yard and I wasn't trespassing. Then I heard a tiny voice "Mama, I came out to help you look for your card things." My littlest slowly approached with a flashlight in his hand, my heart calmed and a smile spread across my face. Together, we found the perfect grass for my card. CAS-ual Fridays Challenge has teamed up with the sketch challenge site Clean and Simple Stamping! 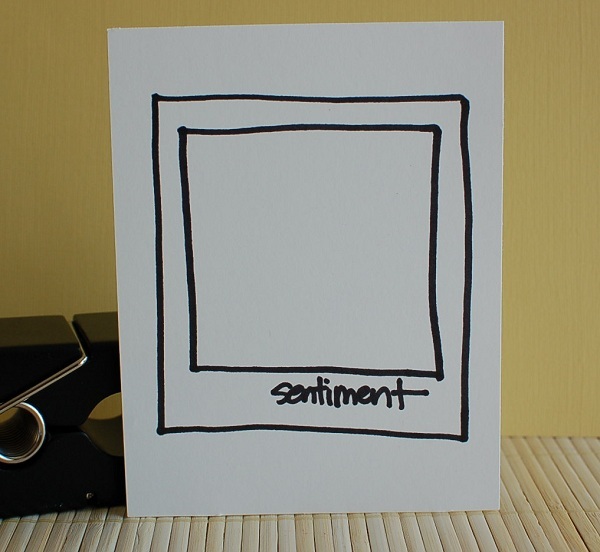 Create a clean and simple card based on the sketch and link it up at either site! For more details on the challenge, challenge rules, prize information from Clear Dollar Stamps and fabulous samples from the Girl Fridays, please visit the CAS-ual Fridays Challenge Blog! We are welcoming a truly fabulous clean and simple designer, Angeline Young, as a guest designer this week! I've decided that I need to start using some patterned paper that I've collected over the years. I let the design and colors of the paper dictate the direction of the embellishments... I found some "card hardware" (after dusting it off slightly) and natural dried wheat grass to complete the rustic look. So, can't wait to see your interpretation of the sketch!